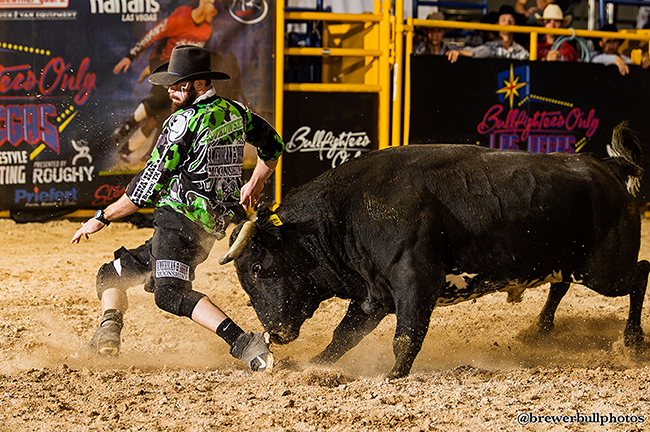 LAS VEGAS – Professional freestyle bullfighting is going under the big top this December. Bullfighters Only will present the world’s top freestyle bullfighters at two sites in Las Vegas, highlighted by the Las Vegas Championship inside a climate-controlled tent at the Hard Rock Hotel & Casino. Tickets go on sale at noon Central (10 a.m. Pacific) on Tuesday, Nov. 8, at HardRockHotel.com and AXS.com. This year’s Bullfighters Only Las Vegas Championship will be the highest payout in freestyle bullfighting history with more than $50,000 up for grabs. There will be seven days of the top bullfighters in the world going head-to-head against the most aggressive fighting bulls in the country. The festivities kick off at 2 p.m. Dec. 1-3 at the Las Vegas Convention Center with the BFO Roughy Cup, a 12-man invitational bullfight. Then on Dec. 2-3, up-and-coming bullfighters will battle to qualify for the BFO Las Vegas Championship, which takes place Dec. 7-10 at the Hard Rock Hotel & Casino. The top 12 men selected for the BFO Roughy Cup have earned a bye into the final weekend, where only four men will advance out of the qualifying rounds. The opening two days will feature eight head-to-head, tournament-style matches, with the winners advancing to the final rounds, set for 11 a.m. Saturday, Dec. 10. The others will advance to the Wild Card round, which takes place at 11 a.m. Friday, Dec. 9. Only one bullfighter from the Wild Card round will move into the finale. At 1:30 p.m. both Friday and Saturday, BFO will pilot a first of its kind live-show experience.